Our Coordinated Transportation aspiration is that the region remains one of the most uncongested transportation networks in the country while supporting all modes of transportation. Coordinated transportation is essential both to building our economy and maintaining a high quality of life. This is true regionally as people often cross geographic boundaries to work, live, and play. This coordination is becoming increasingly important in our global economy where economic opportunities are often related to the mobility of people, goods, and information. Better connect our region to other metropolitan areas such as D.C., Raleigh, etc. Access Across America is an annual report from the University of Minnesota, Center for Transportation Studies. Plan 2040 is a long term transportation plan for the Richmond Region. Walk Score assigns a score to any city or address, ranking the walkability of the selected location. 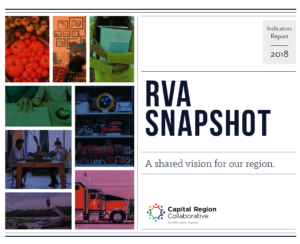 Richmond Regional Mass Transit Study is from the Richmond Regional Planning District Commission and it analyzes transportation shortfalls in Richmond region. GRTC Comprehensive Operations Analysis is a report from the Greater Richmond Transit Company on the function of their operations.